Newsletter a day late, this week has been like a fire drill since Monday. One of those weeks where its nothing unusual or a major type event, just too many small “extra-curricular” items that tip the cart. Monday had an extra trip to Burlington for supplies, I had to help our 84 year old neighbor fix his mower, we did deliveries and took the big truck to the mechanic and then topped it all off with a lovely evening at Watts Grocery in Durham for their wine dinner which featured our products. Tuesday (after arriving home late the previous night) we hit the road at 7:00 a.m. for an all day meeting in Goldsboro, we are on the Board of Advisors for the Center for Environmental Farming Systems. Back to the house about 5:30 in time to turn around to head into Carrboro for another board meeting for the Growers’ Choice poultry cooperative. 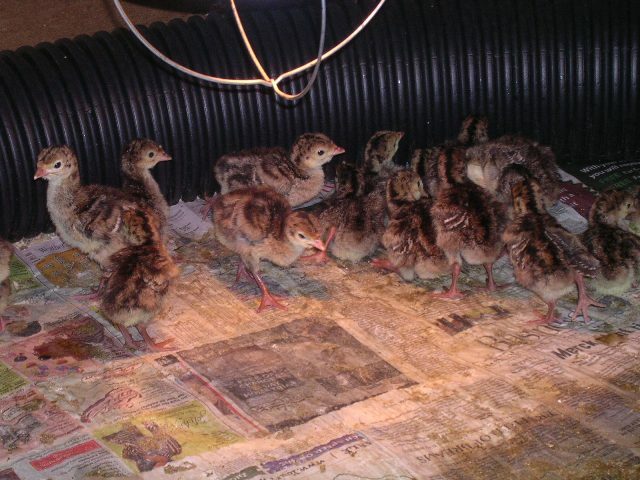 Wednesday up at the crack of dawn for the unusual chores and to prepare the brooder for the second round of turkeys that normally arrive at the Post Office early in the morning. No call by 8:30 so I begin calling around to see where they are. “Yes they were shipped on Monday”, she says at the hatchery. Now we’re worried that they are sitting on some hot tarmac somewhere cooking (we hear these horror stories from other growers). Second call to the Post Office, “no not here yet but there is one more plane that comes in at 10:30”. Finally the call comes in at 11:30 they are here. Betsy rushes up to Graham to collect them while I continue to work with the staff on the days projects. By 1:00 the birds are here and installed in the brooder, all healthy and running around. A quick bite of lunch and then we have to load and head off to market in the 95 degree heat. By the time I get home and in the house at 8:00 last evening we are both fried. Dinner and to bed by 9:00. As my sister in law says, who is a nurse who works a crazy schedule of something like six twelve hour days straight, “I am headed into the tunnel”. This is how she refers to going back to work after her days off. We are headed into the tunnel now too, all of the growers at market are in the same place. The early season excitement is past, the rush to get cool season crops in and out, the beautiful spring days, the planting and tending of the summer crops. Now the heat is here and it is a careful balancing act to keep it all going while not burning the body out. You can begin to see it in their faces now, that look of too many nights without enough sleep. Now don’t misunderstand me, we still love this work and life, but all jobs have parts that take more effort or patience to get through to the next step. How many days is it until the first frost? Great news, we recently heard that we have been accepted as delegates, once again, to the Slow Food Terra Madre conference in Turin, Italy this October. As you may remember, we have been extremely fortunate to have been able to attend the previous two Terra Madre’s in 2004 and 2006. We have another strong group going from the Triangle area including eight of us from the Carrboro Farmers’ Market. This world meeting of farmers, chefs and others in the food system has been an inspiration to us and we hope to be able to expose others to some of what we have been able to experience there. Slow Food pays for all of the delegates expenses once they get to Italy but they have to get themselves there. Look for various fund raisers this summer and fall, sponsored by Slow Food Triangle, to help send our local people. The first of these is this coming Tuesday, July 1st, at the Lantern Restaurant. A Greek wine dinner, featuring a Slow Food Presidia wine (Presidia are projects aimed at helping to preserve a food or food making tradition). Andrea at Lantern says there are still seats available. It will also feature some of our products on the menu.